Travelling to Istanbul, Turkey for 24 hours to check out the food was a wonderful experience. 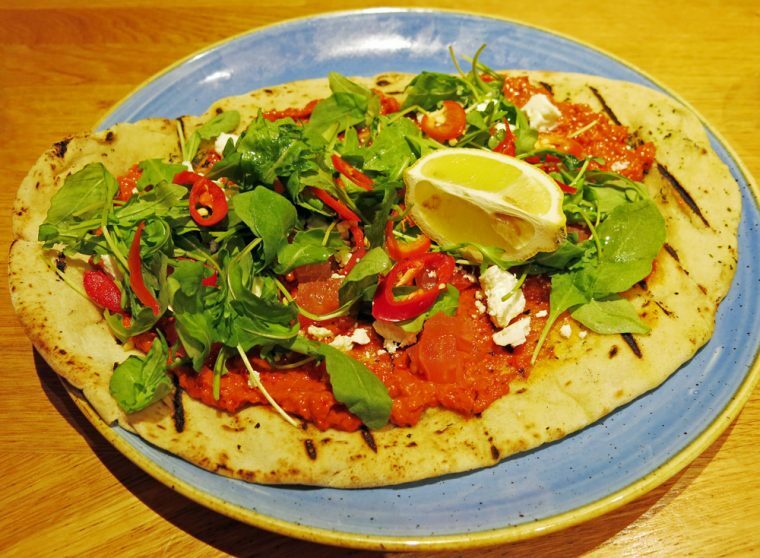 The invitation, from Giraffe, was to explore some of the street and cafe dishes and then visit a local Giraffe restaurant to see how the new World Menu took some of those ideas onto the menu. 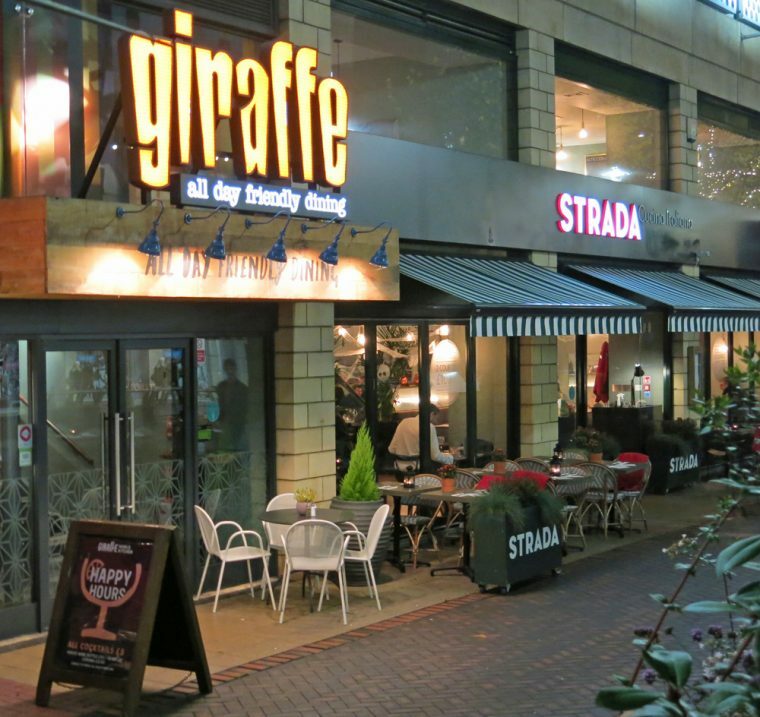 In Reading, Giraffe has a great location, just outside the Oracle shopping. On a sunny summer evening, I’m often to be found drinking a glass of Cava sitting outside with friends. 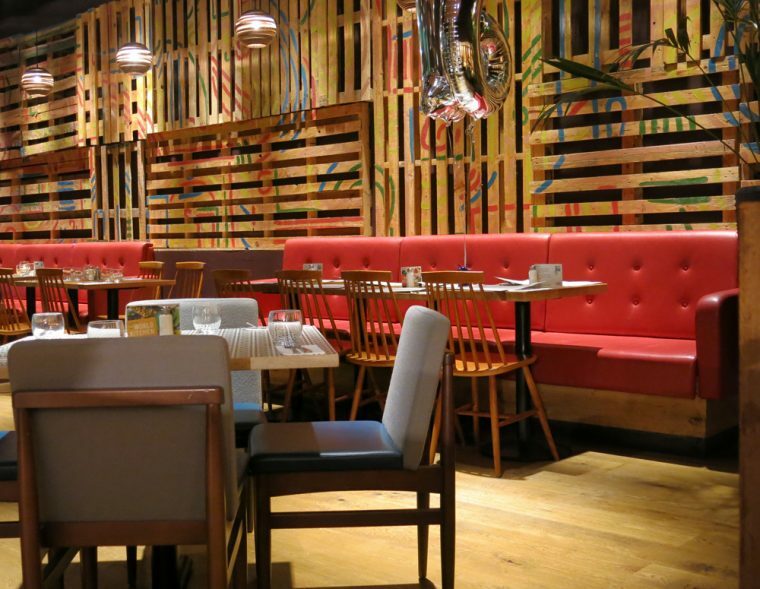 And, although the weather isn’t exactly ‘al-fresco dining’ right now, the inside of Giraffe is friendly and welcoming. The menu offers a good range of value for money dishes – some for sharing, some to keep for yourself. And, we went along to try a few dishes. The pide, a Turkish flatbread which I also tried in Istanbul, was delicious, though the version I ate in Turkey was closer to a calzone than a pizza, with the flatbread folded over the filling and then sliced into finger size portions. But, this was delicious and spicy with plenty of topping including a red pepper and harissa tapenade, tomato, rocket, feta and chilli. It made an excellent sharing starter at £6.95, there was more than enough for two of us. I picked the blackened salmon £14.50) for my main course. If I’d wanted to stick with the Turkish theme, I could have chosen a spiced roasted aubergine on a warm salad of brown rice. 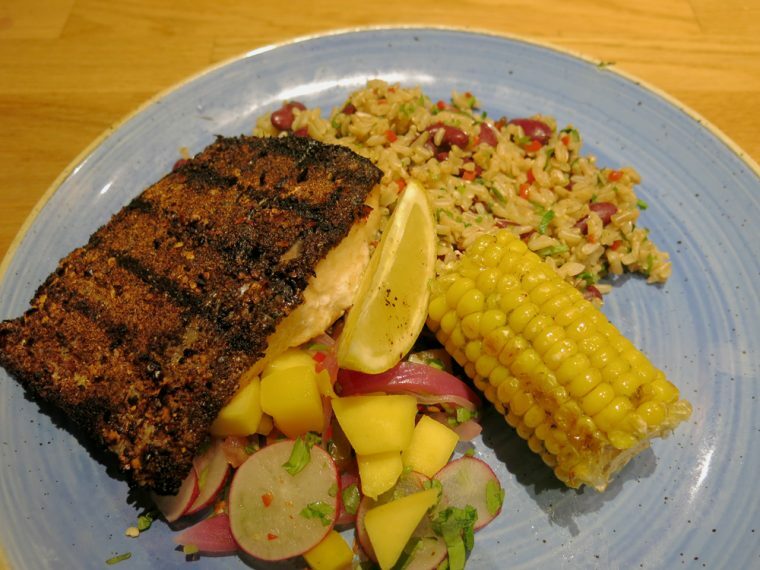 But, I am afraid the idea of a cajun style salmon fillet served with brown rice, kidney beans, corn on the cob and mango salad was just too appealing. It was delicious too, especially served with a totally unnecessary but nice portion of skinny fries. Meanwhile, my companion picked the slow cooked jerk ribs£15.50) . You can’t actually see how large the portion was here – I think there are three pork rib racks on the plate though, and he was completely defeated. It would have been enough for two people, especially with the generous helping of pide! His sweet potato fries were utterly delicious too – perfectly crispy sweet potato fries are actually quite a challenge to produce. Along with our food, we drank a very pleasant bottle of Malbec, priced at £22.95 a bottle. It’s the most expensive wine on the list but still quite a bargain! We were far too full on this occasion to order dessert, but from other meals, I can thoroughly recommend the churros – the portion for one will give you six churros or you can order a larger sharing version too. I’m a big fan of Giraffe. 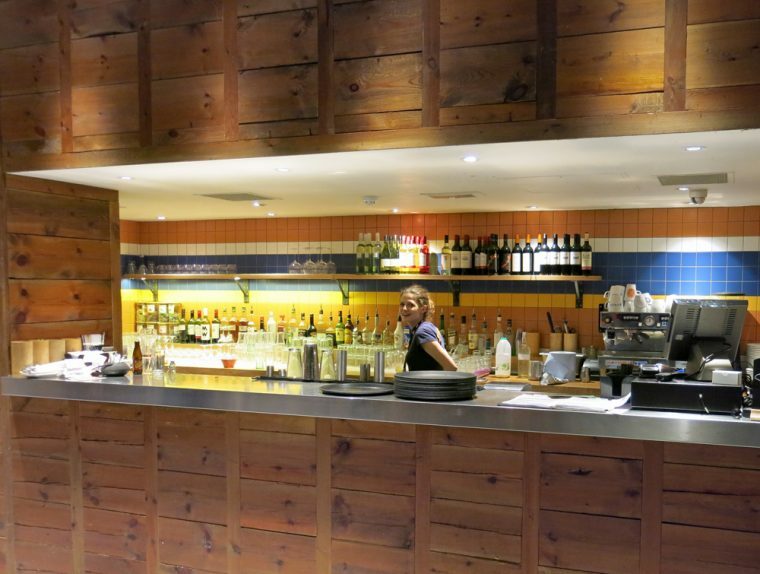 It’s a great place to meet up with friends and share a selection of dishes. They do some pretty good cocktails too. And, there’s something for everyone on the menu and all the food is fresh and tasty. I’m planning on eating my way through the menu over the next few months so please follow me on Instagram to see more!